We are a leading Manufacturer of sales force automation software and sales management software from Ahmedabad, India. Salesforce automation software allows you to standardize your company’s sales processes and activities, from lead to quote to conversion, along with reporting and efficiency analysis. This system can collate numerous sales records in minutes in place of hours it would take if you do things manually in a spreadsheet. You can effortlessly analyze vital metrics including conversion rates, win-loss ratio, and lead time. Moreover, you can display a detailed outline of how well your sales team is performing with regards to products, areas, services, and leads. Salesforce automation software can fast-track your sales cycles to make sure you meet your goals sooner than later. 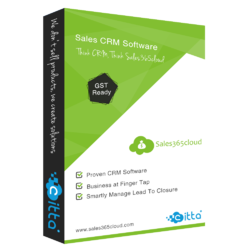 The best-rated app and front-runner in this category is sales365cloud.